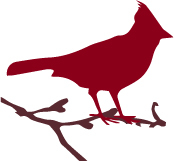 This is the second post (of a few) in which I’m sharing our itinerary for our recent trip out to Jackson Hole, Grand Teton National Park, and Yellowstone National Park. 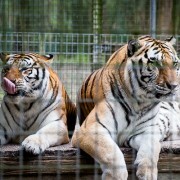 The first post is here, if you missed it. As much as we hated to leave the Grand Teton National Park, we knew that adventures awaited in Yellowstone. We also knew that we’d have a chance to revisit the Grand Tetons during the last two days of our trip, since we were spending the last two nights of the vacation back in Jackson. Those snowy peaks, despite the fact that we couldn’t reach them (and oh, how we wanted to), had imprinted themselves on my heart. After one last breakfast at the Pioneer Grill, and after one final view of the mountains through the hotel’s large glass windows, we checked out of the Jackson Lake Lodge and headed north to the southern entrance of Yellowstone. The distance from the Jackson Lake Lodge to our hotel for the night, the Old Faithful Inn, was listed as 39 miles and should have taken us just over an hour. We took our time, however. We did not want to miss a single sight along the way, so it took us about three hours. It was a pathetic snow pile, but my kids didn’t care. 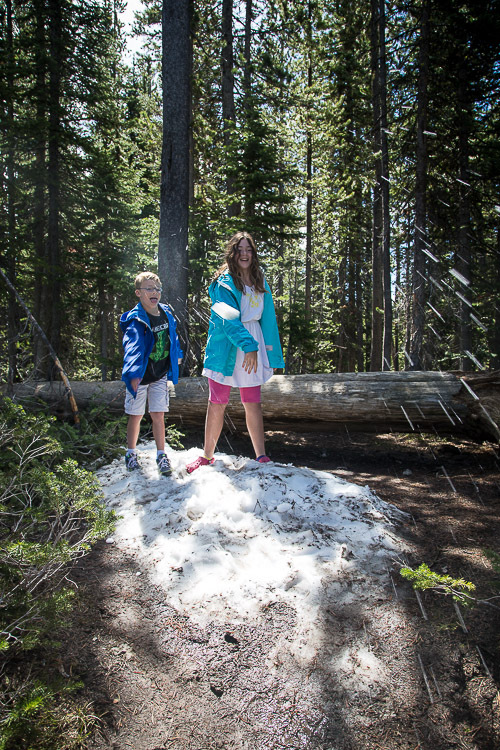 Soon after entering Yellowstone, as we entered higher elevations, we started encountering snow. The kids were thrilled to see snow, and especially snow that wasn’t just in the distance on faraway mountain tops, but in piles and slicks on the nearby mountainside, just off the road. We pulled over at least twice so Maddie and Oliver could throw icy snowballs at each other and at their father. They kicked the snow and poked at it with sticks and squealed and giggled. They lamented that we live in Florida, where it never snows. 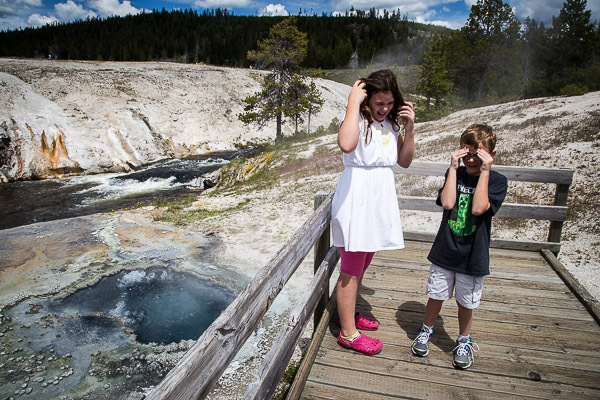 It was obvious when we arrived at the Old Faithful area for two reasons. 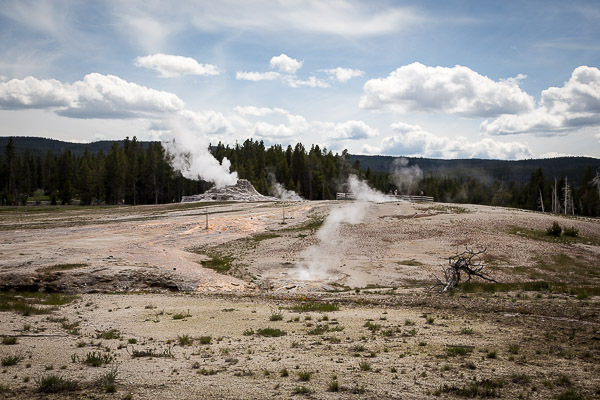 First, the road became more modern, with well-marked, interstate-style exit ramps leading to the famous geyser and the associated historic hotels (the Old Faithful Inn and the Old Faithful Snow Lodge). 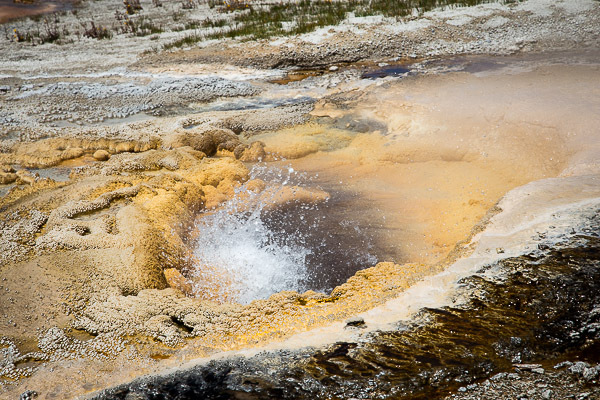 Second, as we approached the geyser area, we noticed steam rising from barren spots of earth in all directions, as if there were fires burning under the earth’s surface. It was surreal. It was also a very visual reminder of how insignificant we are in the much larger scheme of things here in the universe. 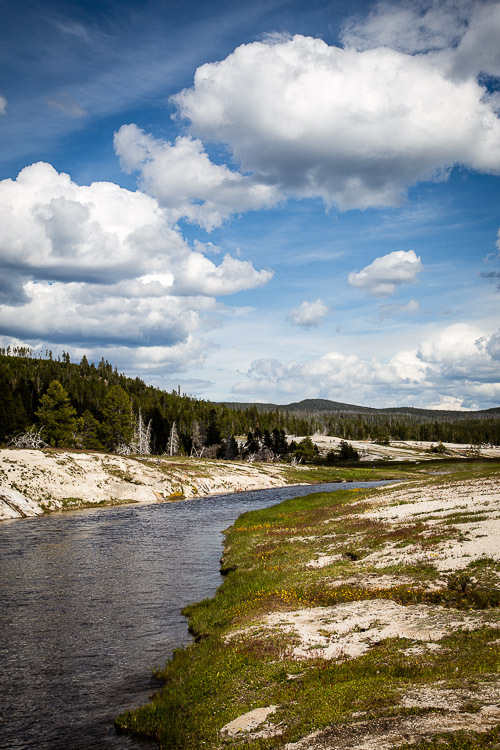 No internet in Yellowstone? No television? Who cares. 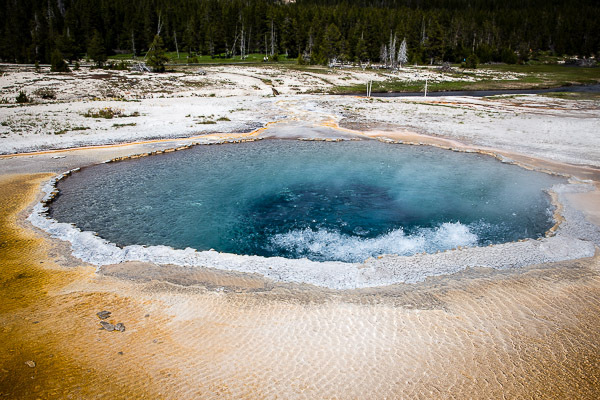 There’s a giant volcano underneath Wyoming, just biding it’s time. Waiting. Stewing. 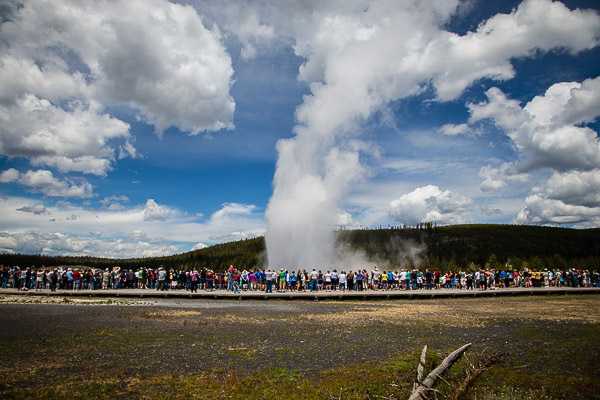 Here’s a tip we learned on the fly: if you want to have a leisurely lunch at one of the restaurants in the Old Faithful area, and if you don’t have reservations, wait until Old Faithful is about to go off and you’ll find the restaurants are nearly empty. We happened to time our lunch perfectly. It was nothing fancy – a bison burger and fries at the Old Faithful Snow Lodge Geyser Grill – but it was heaven to not have to fight a crowd or wait in a long line. After lunch, we waited on the next eruption of Old Faithful, finding a spot in the grassy area behind the main viewing platform. It was incredibly crowded, not liked I’d remembered from when I was there as a kid. Of course, as a kid, I focused more on the marmots, not Old Faithful or the people watching. The eruption was spectacular, exactly as advertised. Oliver and I had discovered the Old Faithful live webcam about a month prior and we had been watching it from the comfort of our air-conditioned living room in the weeks leading up to the vacation. Watching in person is so much better. Old Faithful and her faithful crowds. We spent the rest of the afternoon wandering the mile(s) of footpaths around the other hot springs and geysers in the Old Faithful area. 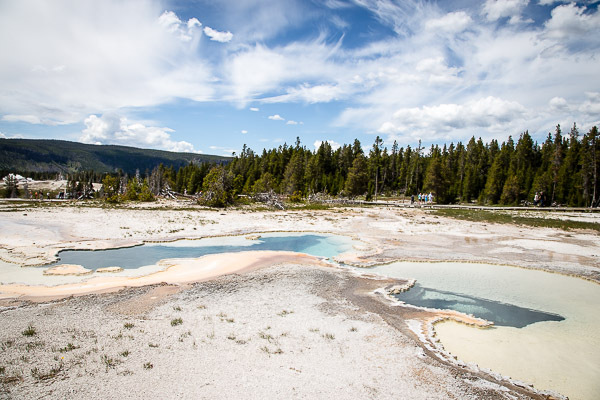 There are so many more thermal features to see other than Old Faithful. Each one is unique and has its own personality. 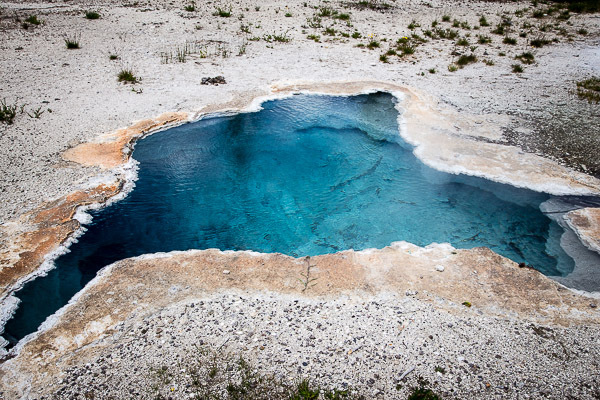 Some sputtered and coughed, others bubbled violently, and other seemed so calm with their blue and turquoise waters quietly steaming – so deceptively cool and serene, yet (as we learned in the Visitor Center) – near boiling to the touch. Any of these features could be fatal if you happened to fall in. Again, it was a great reminder of how little we are in the larger perspective. Hot springs smell of rotten eggs, in case you were wondering. Again, the sky is bigger in Wyoming. I made two advance dinner reservations over the entire nine days of our vacation, and our Day Four dinner was one of them. 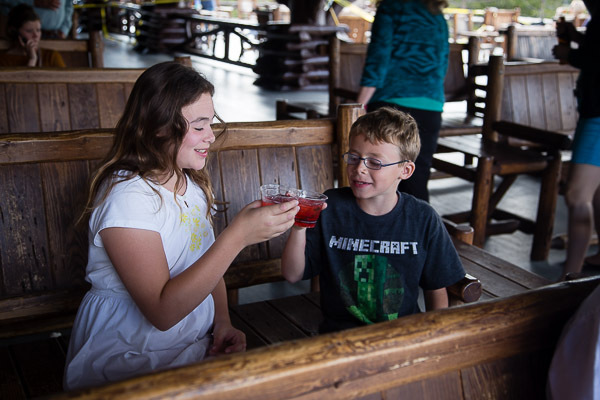 After cocktails (Shirley Temples for the kiddos) on the upper patio of the Inn, we had a wonderful meal in the Old Faithful Inn Dining Room. 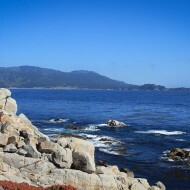 This was the location of one of the three food photos I took during the entire vacation. 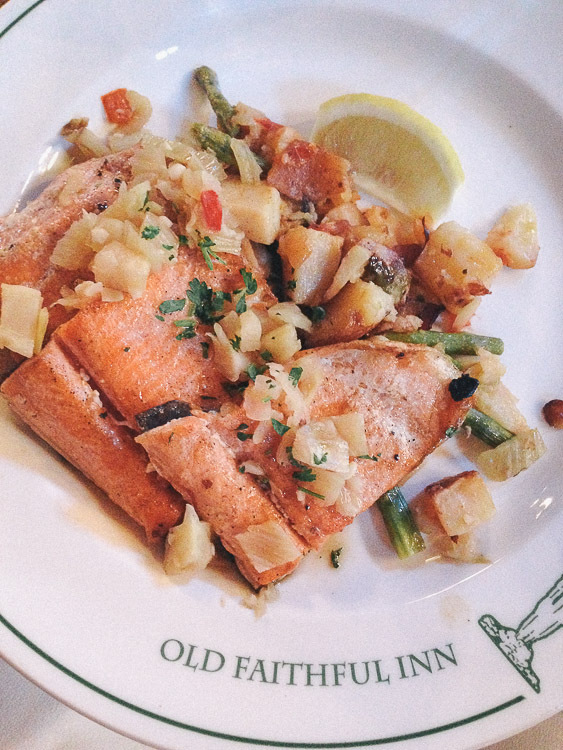 The photo doesn’t do the meal – a red trout hash with asparagus, bacon, and potatoes – justice. The red trout hash. It was fantastic. Later, after dinner, the geyser viewing area was nearly empty. Even though it was late, almost 9pm, it was still light out. 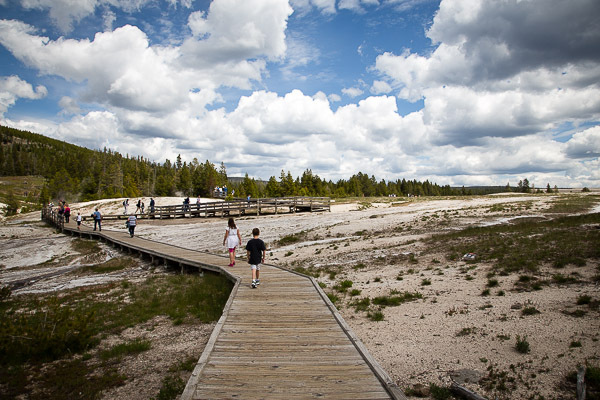 We wandered over to the boardwalk surrounding Old Faithful and sprawled on a bench. Our legs were tired from walking at least six miles that day (more if you trust my husband’s FitBit over mine). We lost our binoculars, and then we found them again at the Old Faithful lost-and-found desk – some kind person had turned them in after finding them. We had sunburns from not being diligent with sunscreen reapplication. We were exhausted but completely happy. We watched one last eruption of Old Faithful – this time with a front row seat and no one blocking our views – and it was a perfect nightcap to our day. 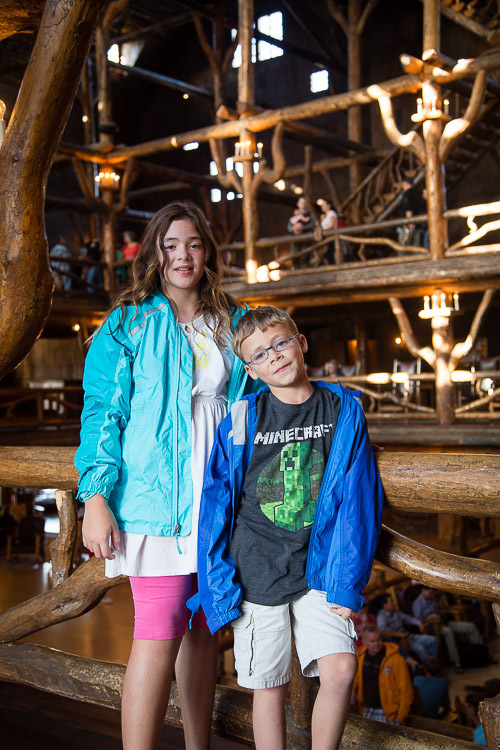 The inside of the Old Faithful Inn is worth seeing, even if you don’t plan to spend the night. 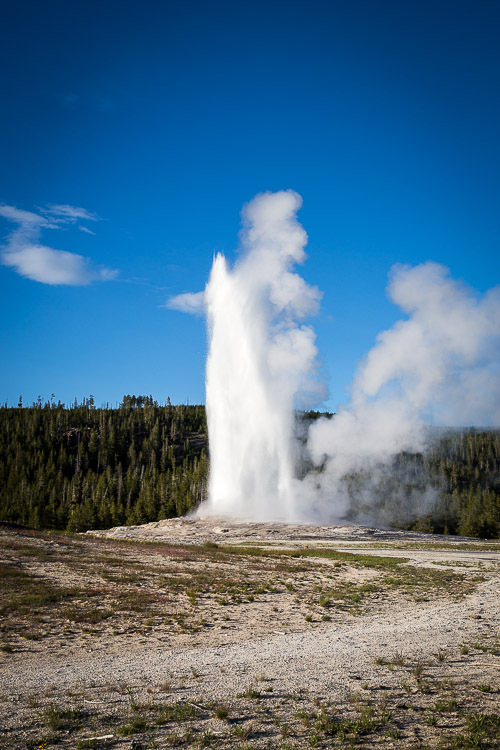 On day 5, we would check out of the Old Faithful Inn and head to Mammoth Hot Springs and to Lake Yellowstone, the location of our next hotel, the Lake Lodge Cabins. Geyser Grill at the Old Faithful Snow Lodge. The Old Faithful Inn Dining Room.